Both sides exchanged chances throughout the match before the game exploded with two goals in a minute deep into injury time. The best chance in normal time when Neil Farrugia's shot cannoned off the bar and the follow up strike blistered past the post. Shamrock Rovers midfielder Emmauel Lawal appeared to give the home side the win when he latched onto a fierce cross and buried the ball past UCD keeper Finn McGowan. But not for the first time this season The Students rallied, with Captain Andy O'Reilly shooting from distance and Sean McDonald was on the line to force the ball home. This emwillnot be deead reuseto be beaten. The result allows Cobh Ramblers to overtake UCD U19s and puts The Students into second place in the Southern Elite Division with our the last match against Cobh. 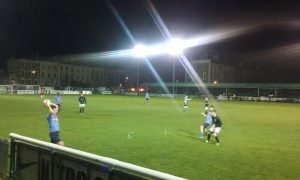 Both UCD and Cobh Ramblers have qualified for the last eight Play-Offs, starting after the regular season. 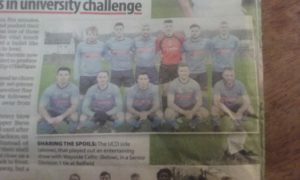 UCD AFC U19s: Finn McGowan, Evan Farrell, Mark Dignam, Joe Manley, Luke Boore (Dyla Rowe 92'), Luka Lovic, Kevin Coffey (John O'Keane 80'), Andy O'Reilly(c), Yoyo Mahdy (Sean McDonald), Conor Crowley (Cian Ryan), Neil Farrugia.